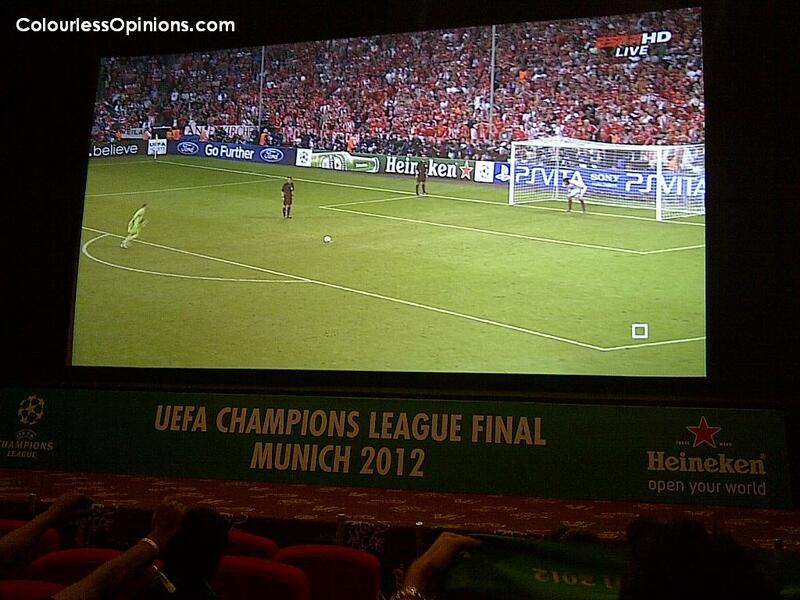 Never thought we could ever watch a football match at a cinema. Invited guests and winners of the Heineken campaign were invited to for A Legendary Night at GSC Signature, Garden Kuala Lumpur, where we got to catch the UEFA Champions League 2012 final match on big screen in HD and were pampered with free flow of beers served by chicks and also other things. Those who loved the experience have got to feel fortunate that they ain’t Muslims (because in Malaysia, it’s illegal for Malays to consume alcohol and hence they are never invited for any alcoholic events). But I, for one, thought it was quite a suffering experience. The whole thing was pretty cool at glance and very thoughtful indeed. A small device with a call button was provided for the viewers to request for beers to be brought to their seats. Before the game, there was a lounge where there were activities, such as a football motion video game and a mini foosball competition where the winners win footballs autographed by ex-superstar players, and music performances by DJ’s and a violinist. 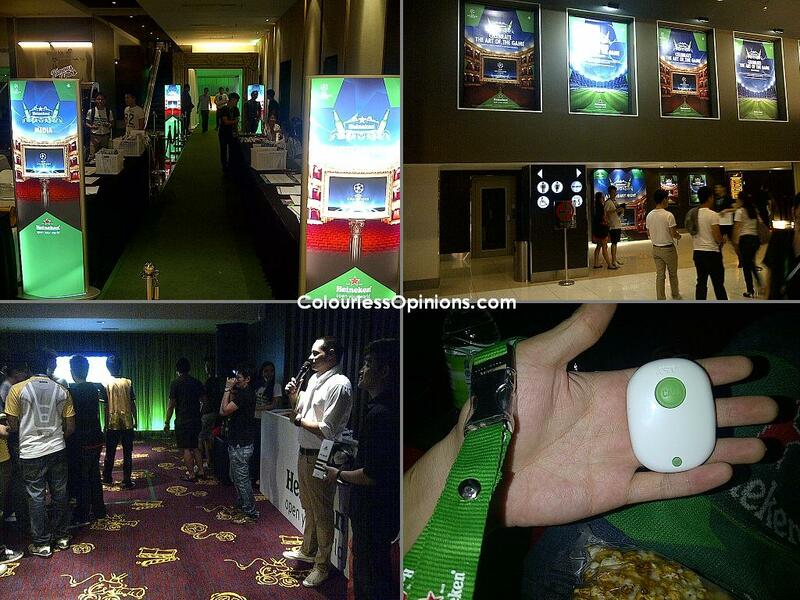 While all that was going on, free flow of Heineken beers and finger foods were being served to everyone. 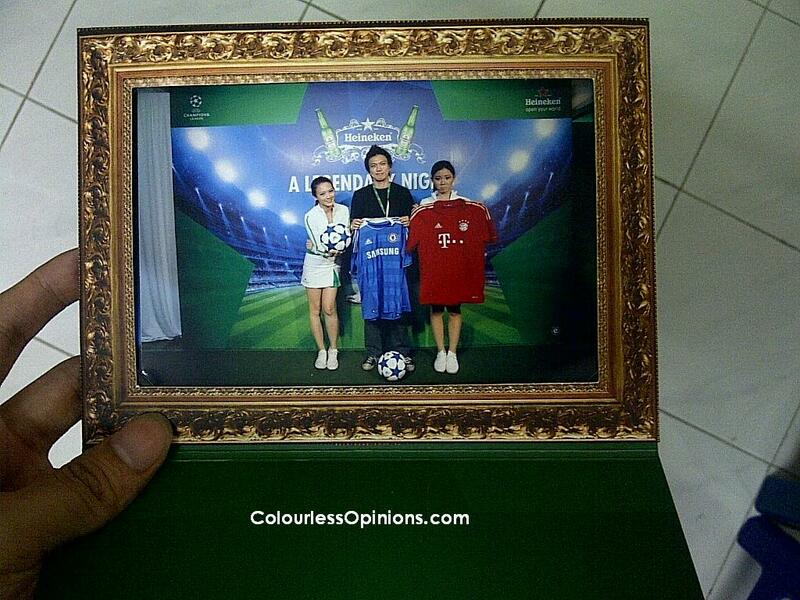 Any drinker who’s a Bayern Munich or Chelsea fan would’ve enjoyed the whole event. However, I’m a fan of neither of the clubs and like all the other winners and invited attendees, I was advised by the organisers to arrive at the venue before 12.30AM. That’s at least 2 hours and 15 minutes before the kickoff. What the heck was I gonna do in a stuffy lounge crowded with people who were being served with unlimited alcohol? Insufficient seats and tables, uncomfortable to stand around and chat, noisy, the queue for the video game was long, I never liked foosball and there wasn’t a smoking area. It felt like the longest wait ever just to watch a football match. Incredibly boring. I pity the girls who had to follow their boyfriends to the event. From the uncomfortably warm lounge to the low temperature cinema hall. It was freezing cold in there, it felt even worse after drinking the cold beers. Which was why I didn’t use the beer-calling device provided. The free scarf provided was of no use at all besides marketing for the brand. The rather unexciting first three quarters of the game’s 90 minutes were not helping. That, the coldness and consumed alcohol challenged me to stay awake. I saw some of those that were seated around me were sound asleep. Even Joey G, the emcee of the event, seemed to have left the hall before the whole match ended. 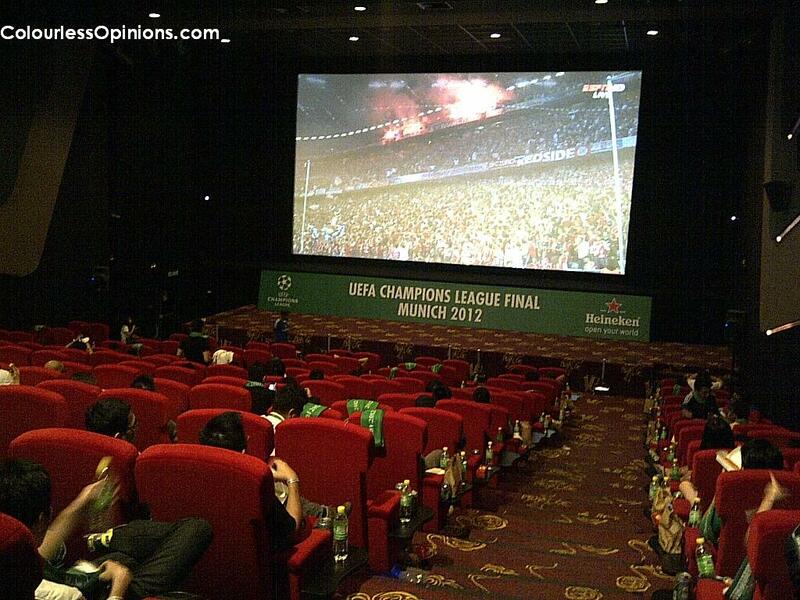 There’s no way I’m ever gonna watch a football match at a theater again. Not unless there’s something new, like a 3D screening or something. I wasn’t unhappy to be holding a Chelsea jersey but the Heineken staff on the right seems even more upset than me. Guess she either hated her job or already knew that Bayern Munich was gonna lose. Photo was taken before the game. I thought watching a football match with a big screen would be awesome. But based on your post… seems like watching at home would be more comfortable. it was a new experience for me… didnt use the device at all cause it's a bit weird to drink in the cinema hall for me. Overall I did not expect Chelsea to win especially the penalty shoot out…. Interesting, I wonder how do they serve the beers when the rows are pretty long. HAHAHA i pity the girls who had to accompany the bfs before the match. YALOR!! But i was there for John Terry. Until… someone told me that he is not going to play wtf.